Mechanically fastened Jurgan Pin Balls® offer safe, dependable protection against the hazards of protruding ends of K wires and external fixator pins. Patients are protected against painful snagging, stubbing, or reinjury, as well as inward migration of the pin or wire ends. 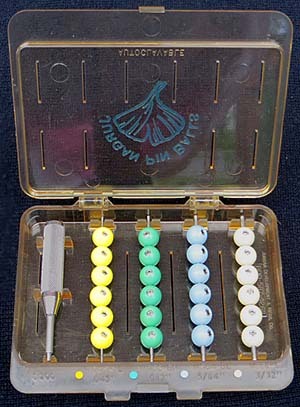 Jurgan Pin Balls® offer precise protection for pin and wire sizes of .028 (.7mm) through .250 (6mm). All series are available in standard white or color-coded colors. Repetitively autoclavable. Sold non-sterile. Certified sterilization process included. Jurgan Pin Balls® are latex free.